I nearly ready to start brazing my frame and just getting all the little details ready. One thing I haven't got figured out yet is how to clean the flux from the inside of the seat stays. I am using socketed drop outs that have a small vent hole which would be insufficient to flush out the tube. The seat lug is the Llewellyn socketed type, I would prefer not to drill a vent hole in the seat tube but I suspect this is the only way to get water into the stay. What do the experts do? Can I just use minimal flux inside the tube and leave it? I would suggest that you avoid placing vent holes in "hidden" locations. It makes the painter's prep work that much harder. I choose one of two approaches to vents and tube interior cleaning. The first is to have two vent holes of reasonable diameters left open. This allows for soaking the interior in a hot water tank and then draining it out. It also allows for the interior to dry in time (and heat can accelerate this). The classic example are lugged main frame tubes as their open ends are hard to seal . But any sand blasting that gets in is easily blown out. I use about a 1/4" vent hole at the closed end of these tube for that second vent. The other approach is to use fairly small (3/32" as a 6D nail can be used as a later plug) vent holes at both ends of a tube. Soak and flush out. Dry out. Then plug both vents, I usually use the mentioned nail and silver taking care to not leave any more flux inside as I can. Yes, there's a tiny amount left but with no access to moisture this tiny amount shouldn't be any issue. Stays, bridges and blades are examples of where I do this. I have tried to be tricky and vent bridges through the stays, seat stays through the seat tube, blades through the steerer/crown but have had painters take me to task when sand sifted out at the wrong moments during their work. I find that the more I do to not have to have the painter take care, read my details I include with the job or look for vents that are not obvious the more likely I get a nice paint job. I used similar dropouts several times and to fill the seat stays with water I turned the frame upside down and filled the stay with water using a pump squirt bottle. An air bubble will form and try to block the water going in but the water stream will overcome that and allow you to fill up the stay. To get the water out you need to shake the frame some. After the water is out I use heat to quick dry the stay and make sure no more water remains behind which will cause rusting. Last edited by Nessism; 02-14-19 at 07:07 AM. I have never added vent holes to seat stays. Am I missing something here? Doing potential damage to the frame? Flux is acidic and should always be removed inside tubes. On one of my early frames I didn't properly clean the inside of some of the frame tubes and the flux came through porosity in the braze joints and ate up the paint. I had a fork that I stupidly carried around with flux all over it for 30-some years before I cut it up. The steel under the flux was shiny. I feel like there are a lot of forks and seatstays with flux inside. If you don't have at least one vent, the hot air inside the tube will blow out your joint when you try to close it. 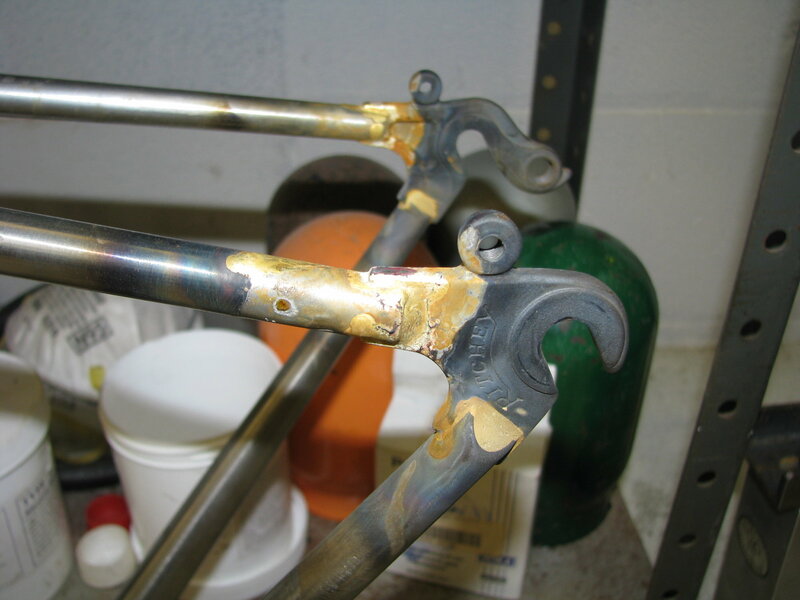 If brazing, it will blow the brass away from the joint, making it difficult to complete the joint. If welding, it will blow away the shielding gas and make a real mess, likely burning a hole in the tube. As far as having flux inside the frame, I don't think its something to be too concerned about. Vent holes are a good practice, and you avoid the annoyance of the air forming a vent hole against your wishes. With small tubes, you can heat them up enough that vents aren't really needed. I do this with my racks, for example. Brazing gives more opportunity for this than TIG. There are people that fill the vent holes with brazing material when they are done. better to have too much than not enough. Agreed. For socketed drop outs I do as I do with main tubes, sand clean the last few MMs inside and also have that coated with flux. For tabbed drop outs I'll file/grind,sand (depending on access) inside up past the tab and also flux to that point. very apprentice tolerant, so better than as a couple friends did, Bought a Butted 531 tube set & burned holes in it,, OOps ..